Copernicus Films - Japan "Philosophical Landscapes"
Japan Philosophical Landscapes "The Pure Land Paradise"
The gardens and architecture of the Heian period lasted from the late 8th century to the late 12th century. They reflect the process of Japanese reinterpretation and finally assimilation of Chinese culture. A significant feature of Japanese gardens is their ability to arouse poetic emotions in the viewer and this was especially true of the Heian period. Rocks, flowers trees are not just inanimate objects but possess their own being and sensitivity. To be sensitive to their sensitivity is a prerequisite of Heian art. Journeys around a spatially organised landscape was the principle behind the pilgrimage circuit. EG in Kyoto. The pilgrimages not by a hierarchical route leading to an ultimate goal but on a non hierarchical organisation around a system of magical numbers. P and lost none of the religious character. pilgrims were guided not to a specific destination but past a certain number of temples on a route all of which were of equal importance. This is an abstract system which works like a framework which is transferable so that it organise other situations in the same way. (Like a blueprint) Pilgrimages which had stretched over hundreds of miles could be condensed to fit in your own back garden These type of gardens were a final attempt to re introduce an explicit religious element into the secularised traditions of garden architecture in Japan. This section of the film focuses on the Silver Pavilion of Ginkaku ji. It suits my purposes over the more popular Golden Pavilion in Kyoto as it describes more directly the phenomenon of Philosophical landscapes. 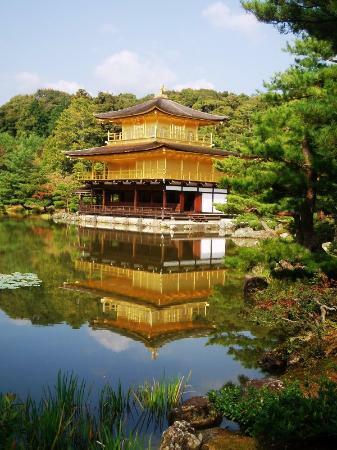 Most people are concerned with the Golden pavilion because of its obvious beauty, a striking golden temple set in the middle of a pond, its still golden reflection a mirrored upturned version of itself creating an uncanny sensation of a floating vision in mid air. However in some ways the Silver Pavilion, Ginkaku ji, is no less beautiful despite its subdued presence if compared to the Golden Pavilion. The addition of moss covered grounds and what I would call "sandscapes" - abstract images made with sand and grit give it a unique quality as a Zen temple. They do not represent the landscape or depict a particular landscape but communicate an essence or idea. The cone of sand in the garden resembles Mount Fuji however this is but a surface interpretation. A mountain is seemingly a solid thing ostensibly made of hard rock. However mountains can fall or increase in size with volcanic eruptions. A miniature mountain of sand conveys this state of flux or indeterminateness of things and life which Zen Buddhism teaches. The volume of sand shaped into a cone is held in a state of static but fluid tension which can change with a gust of wind or a heavy downpour of rain and then reconstituted anew. Similarly sand as waves convey the inter penetrability of things. This constant blurring of borders between materials shows the solid but non materiality of an idea given expression in three dimensional space. The essence of Zen Buddhism. Arrived yesterday in Tokyo. Still warm and a little humid even at this time of the year. Settled quickly into our apartment which is in the Nihonbashi area of Tokyo. Some dissappointments. The furniture in the photographs does not correspond to the furniture in the apartment. In particular there is no divan so literally there is nowhere to sit apart from the chairs around an enormous round table which dominates the entire apartment. No amount of discussion or remonstration will get the furniture we wanted. The only answer we get is "that furniture is too big for the apartment". The question arises why was it advertised with those pieces of furniture. I have been informed that it is not entirely uncommon. Lisa, the Japanese woman who works in the real estate office and speaks English with a perfect American accent, just smiles and tells me we will be very comfortable there. As I organised everything over the internet there was no way of checking anything before hand. However the apartment is very comfortable. Divided into two halves it is relatively roomy for an apartment in Japan. It is situated in a region called Suitengumae which is close to the Sumida River and seems to be closed off from the hustle and bustle of Tokyo. That is if you dont count the overhead highway which rumbles away all day and night almost beside our window. However I'm not complaining. We are in Tokyo at last and have three months of filming and getting to know Japan in front of us. The apartment itself is very well situated. You walk out the door and straight into the metro. Its literally fifteen seconds from our own front door. In some ways that is quite normal for Tokyo. Wherever you are in Tokyo you can look up and there will be a metro somewhere close by. Its the beginning of autumn here and the leaves are turning golden red and brown. This is a beautiful time to be in Japan especially from a film makers point of view. Still feeling jet lagged but we already managed to get to the Sogetsu Ikebana exhibition at the Takishimaya Dept store on Nihonbashi not far from where our apartment is located. Japan has a long tradition of putting on art exhibitions in department stores or commercial organisations. Its an incredible exhibition, jsut the scale of it is extraordinary as well as a very high level of art. Today we went to the exhibition again after lunch on Ginza and met up with Natasha's friend, Fujimoto san and some of her students who were exhibiting there. Natasha took photographs of many of the compositions. I was especially struck by the composition of Akane Teshigahara which had a central place in the exhibition it measured several square metres and was constructed with large branches and set inside where golden orange flowers - Hibiscus I think. The whole effect vibrated and pulsated with energy and life. The branches had been painted with what seemed like two types of ochre paint (dark brown and Red) mixed with dust or powder so that the surfaces were matte and gave off an effect of volume. The effect was vaguely like surrealistic paintings, although this was a sculpture. Have sent off e-mails to our friends Paul, Akira san and Sumida san to let them know we have arrived in Japan. Maybe we will meet up with them sometime soon. Japanese days - Following in the footsteps of Basho ? Received answers to our e-mails form Akira Suzuki and Paul Cunningham. Akira san lives about 15 minutes walk away from where we are living in Suitengumae. I was just looking at the map and we are right in the area where Basho lived during the 17th century across the river from us almost directly opposite. Last time we were here Akira san took us all around the area and I remember looking across the river at a row of cherry trees which were about to start blossoming and thinking how good it would be to live around this area. By accident that is exactly where we have ended up, following in Basho's footsteps so to speak. Basho was a poet who made journeys all over Japan writing about what he saw and felt on the way in the form of Haiku (three lined verse).Basho was interested in the spirit of place. He visited various places to commune with the memory of those with whom he shared the same attitude to life. Though they were dead the surroundings were infused with their presence and would give inspiration to the visitor who was sensitive to their presence. Places, were specific historical events had taken place either religious military or artistic, were of special significance to Basho as a means of reestablishing a spiritual and temporal link with the past. Basho says of a great teacher from the south. Do not follow the ancients but search for that which they searched for. It is true for Poetry. In other words in order to make poetry like the ancients there is no need to to copy them or imitate them but follow the same path as them, see what they saw, enrich oneself with there creative worries but write your own way, find a fresh way of expressing something which may have been expressed thousands of times over by other poets. Basho struggles to do this himself. Whereas many Japanese poets wrote of nature and had almost exhausted its capacity for expression, for Basho nature takes second place often allegorically showing people and life. Many poems by Basho are honed from legends and folk tales, his understanding of beauty had deep roots in folklore. For Basho there was an indissoluble link between nature and people and on the shoulders of the people of his time he always felt a breath stretching far back into the centuries. In this breath he found the durable source of art. In the epoch of Basho many people both in the towns and country endured severe hardships which Basho witnessed at first hand in his travels and which he included in his poetry. Settling in a bit more although its still difficult to aclimitise. Its not like we are here on holiday. There is a lot to organise: finding places to buy food, places to eat and organising our schedule. Went to the second part of the Sogetsu exhibition at Takashimaya Department store. Natasha took more photographs. Earlier we were at the Sogetsu headquarters on Asakusa where Natasha had some business to complete for herself and for her students. We went into the cafe there and had lunch. Brilliantly designed building. Very contemporary even though it was built at the end of the fifties. The 12 or 15 stories high the design is as modern now as it was then. I like the exhibition hall in the lobby with its exhibition space and "waterfall".The building serves as the international headquarters for the Sogetsu organisation. The adminstration of the branches from all over the world is dealt with here. This evening met up with Akira san and he took us to a restaurant and we had a meal together. Very inexpensive and and tasty. We will go there again. Nice to know that there are some reasonable places to eat even in the centre. We talked a lot about David Burliuk and the film I am going to make during this trip to Japan and about art in general. (Themes as yet not dtermined) He explained to us how he was invited to the David Burliuk 125 year anniversary in the Ukraine this year by the Governor of Sumy no less where David Burliuk was born, with all expenses paid. Unfortunately he didn't go. It was good to meet with him again he is such good company and easy to talk to and is always ready to answer our questions about Japan. I hope we can spend some more time together. Its getting late and the Tokyo night feels fresh and warm despite it being early autumn. Natasha is sleeping as I write. I'll finish off a few things and then also get some sleep and try and regulate my time patterns to Tokyo time. A web documentary film about the role of landscape in the cultural philosophy and history of Japan and its reflection in the visual landscape from the early Shinto shrines, gardens and architecture up to the modern urban landscape and beyond. As the film is edited and completed it will be released in parts across the Internet. Accompanying the film will be a series of articles, blogs and other material relating to the project, including a diary from Tokyo and Kyoto. Copernicus Films. Ethereal theme. Theme images by merrymoonmary. Powered by Blogger.